Check, ps, the empty spaces in the skin filename. I have experienced similar problem and it was caused by additional space between adjacent words in filename. No, I don't see any additional spaces. Not a big deal but it is odd. 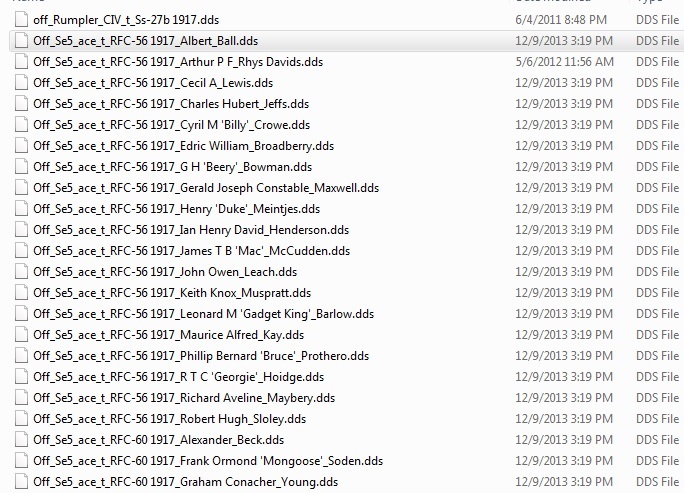 Could you post a screen shot of the file name or retype it here? 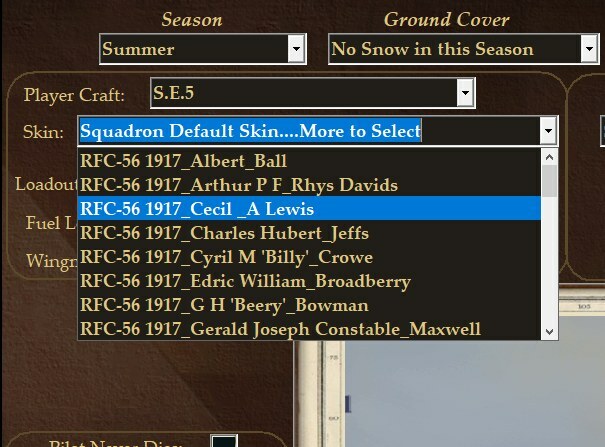 Cecil Lewis is the third SE5 file. Last edited by hoongadoonga; 04/11/18 05:49 AM. Is this the one you are looking for, isn ´t it? Last edited by ArisFuser; 04/11/18 06:45 AM. Have you checked his AC type is really SE5 and nnot SE5a? Second possibility is that there was not available free ace skin slot in mission for Lewis. 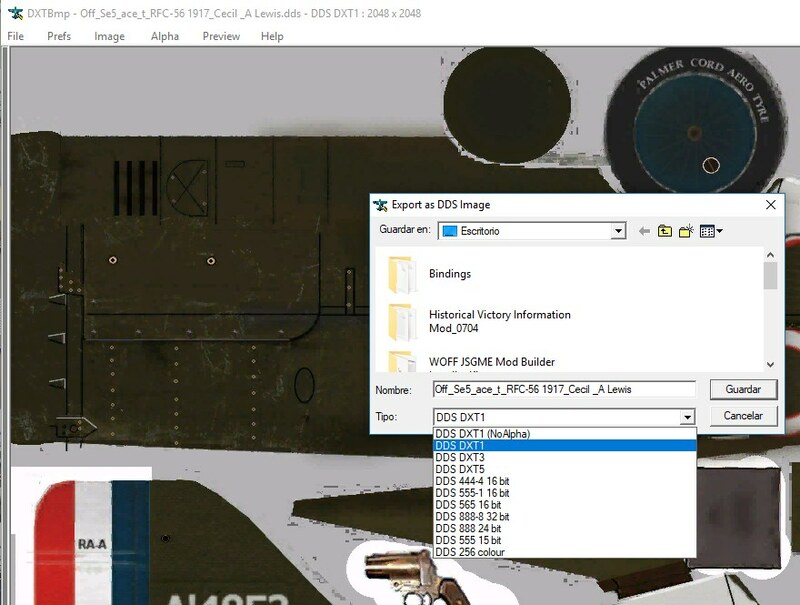 WOFF can assign max 5 or 6 individual ace skins (for the same aircrfat), so, if there were more than 6 aces flying Se5, someone had to draw quadron's default skin only. The problem is not the naming, the problem I think, it´s the way it was saved when it was created. I opened the file with DXTBMP and resaved it as a DXT1 (with alpha). And voila, it works. Last edited by ArisFuser; 04/11/18 07:02 AM. 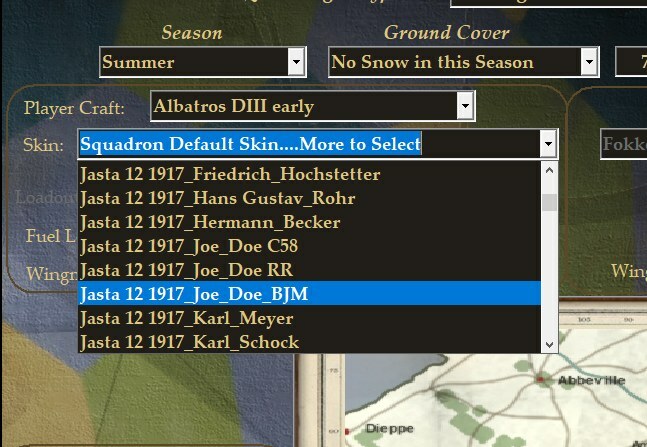 For any future ones, it should normally be DXT1 with No alpha for most aircraft skins. Aha! Nice sleuthing work, Aris. Yes! That's all it was I noticed some of the files are missing the ace. Thank's for help everyone I've been scratching my head for days lol. I love this skin I eventually want to make my own just don't have the spare time to learn Gimp AND fly atm lol. I was wondering if anyone had any idea if WOTR would include the Russian Front campaign as well as North Africa,Italy etc. In other words I was wondering if this would include all theatres during the period 1939-1945 or if it would be just west front focused? I know Il2 does Russian front but would be super awesome to have such a major campaign for WOTR.I know probably too massive to do everything but one can wish =). I would have asked on WOTR news but thread closed lol. 2 rounds of drinks to everyone and fly safe! I had a question about some AI settings in workshop. For realism sake do you guys usually fly with reduced vision acuity and AI damage affects skill turned on or off? I have been flying with them on and was just curious what everyone uses. On behalf of me- both options ON. Both turned on for me too. 1st. Have you tried running the patch as administrator? 2nd. Did your try to run patch with any mods enabled? If so, disable all mods, then patch, then re-integrate. 3rd. Does WOFF run in its current state pre-patch? Worst case, you can always do a fresh install and start from scratch. You can backup and restore your settings / pilots via Robert Wiggins great WOFF backup utility! I'm by no means the go to source for troubleshooting, but figured i'd put my 2 cents in since i'm awake. Give it till morning/afternoon tomorrrow (Today? Lol) , someone more knowledgeable than my humble self will likely contribute. . Thank you for help yes ran as admin all mods disabled. Hopefully dont have to reinstall but I def have my pilots backed up.Also put in ticket at support@overflandersfield.com. Thank You for the help though. I got this same error again but just for the heck of it I loaded up game and checked version it shows in workshop Version UE:4.20-4241. So I guess I'm good to go? Just weird that installation kept encountering error right at end of install and I hit abort and it said rolling back changes. Does this make sense or am I missing something lol?